Nature trail, which leads to fortification near Olešnice v Orlických horách, will make you familiar with technical data and history of light works. On your way you will meet four bunkers type 36. These bunkers were built in 1936. Light works type 36 were probably projected according to a type of bunker in Maginot line in France. Orlické hory was the first region, where the fortification was entered by building bunkers type 36. These bunkers had been built before the whole conception of defence against fascist Gemany was completed. Later, when new strategy of defence was finished, light works type 37 were built. 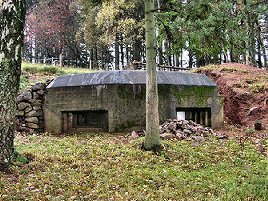 Bunkers type 36 were not very abundant (only 126 object were built between Krkonoše and Mladkov) and many of them were destroyed by the german army during the World War Two. 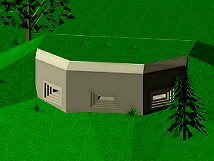 From the nature trail you can continue to reconstructed forts: two light works type 37 and two heavy works NS-47 (Jaroslav) a NS-48 (U Stodol) – infantry building of the fortress Skutina, where the guided tour includes descent to underground. Enthusiased people try to bring these bunkers near original situation. Nature trail offers also a nice walk in the nature and many wonderful wievs on Olešnice and furhter surroundings. Under good conditions you can see wind power plants in Nový Hrádek, hill Ostaš, towns Kudowa-Zdrój and Lewin Klodzki in Poland or even Krkonoše. Nature trail is intended for foot-passengers. The trace leads through protected landscape area Orlické hory. Please, be quite and don´t spoil the nature by dropping litter! Before you start your walk look at the map, which will help you with orientation in terrain. On the map you can see also other bunkers in the surroundings. There is no signed way, but you can try to find them alone.